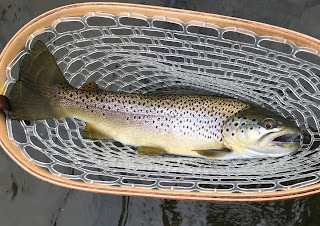 Last weekend we went up to the Catskills again and fished the Beaverkill River both Friday and Saturday before a steady cold rain chased us off the river. The fishing was good and the hatches mixed; at times there were a half dozen different insects hatching. When I say the fishing was good, it wasn't easy, just rewarding with some good sized fish brought to net. On Friday there were Hendricksons, and Blue Quills, Early Brown Stoneflies, Dark Grannoms and Apple Caddis hatching. 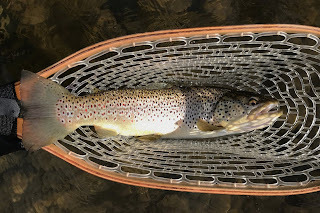 Like the previous weekend, it was almost like the trout took turns rising, and I rarely had more than two fish rising within casting distance. The rises varied; some were splashy and quick (taking caddis), while others were very subtle, barely breaking the surface (taking emergers). I took a few nice fish on my Apple Caddis emerger, and a few on a Hendrickson Sparkle Dun. 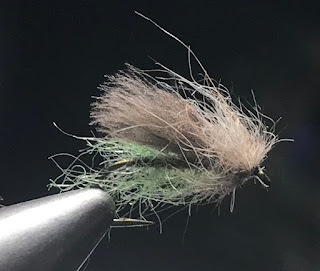 The Apple Caddis emerger can be fished wet swinging it as you would a soft hackle fly, or as an emerger/dry right in the surface film. I took the brown above fishing it in the film over a quick, splashy rise in a seam along a fast riffle. On Saturday we woke to light rain and chilly air temperatures. After tying a bunch of flies and then having breakfast with the others, I headed back to the river about midday, while the other guys stayed back in the comfort of the cabin. Hardly anyone was on the river as a steady rain fell. When I got to the river bank after gearing up I walked up to the head of pool where I had the river all to myself. I few Blue-winged Olives were hatching and after my eyes adjusted to the light and conditions on the water, I saw fish rise above me as I waded out from the bank. I tied on a BWO sparkle emerger and after a couple of casts over the fish it took the fly. 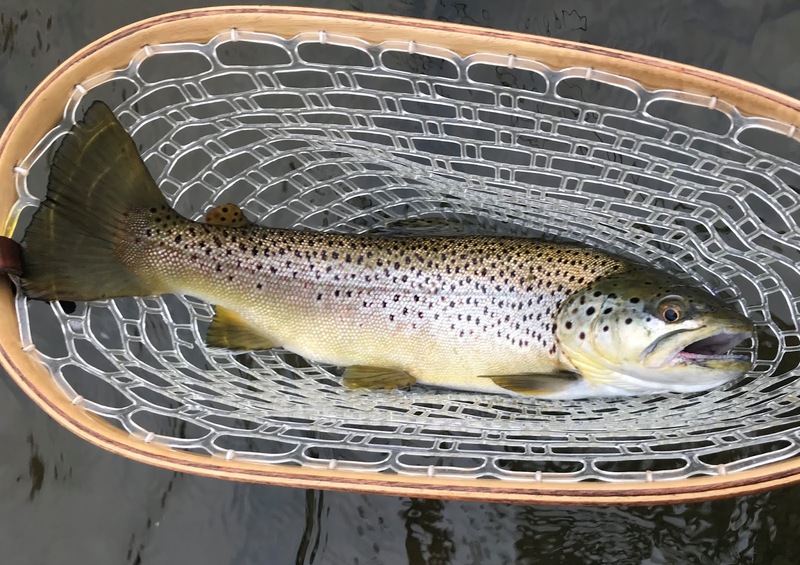 I landed the nice brown and released it quickly. Within a short while, depsite the steady rain and chill, there were Hendricksons, and Blue Quills, Early Brown Stoneflies, Dark Grannoms, Quill Gordons and Blue-winged Olives hatching. The Olives were the most abundant, but after observing different rising fish, it was evident the fish were taking whatever insect happened to drift over them when they were ready to eat. My olive emerger was soaked so I tied on a Hendrickson sparkle dun and when I looked up I saw a head-dorsal-tail rise of a nice fish about 30 feet out in a slick. I made a couple of tests casts and once I saw my fly was riding as I wanted, I made a cast to the top of the slick. The fish rose, I set, and it took my line half way across the river in a flash. I then got control and gained line on the beast before it made a shorter run. We did this dance a few more times before I netted the fish you see below. I managed to bring an other ten fish or so to net before I was thoroughly soaked and my hands stiff from the cold. The rain was falling harder by now and I had a good day on the water, so i called it quits. When I got back to the cabin the others had already left, so I packed my things and headed home knowing the forecast called for rain the rest of the day. I was up that way yesterday. Floated the main stem. Slow until about 3:30 then things slowly got better until about 6, when all the fish in the river came up til dark. 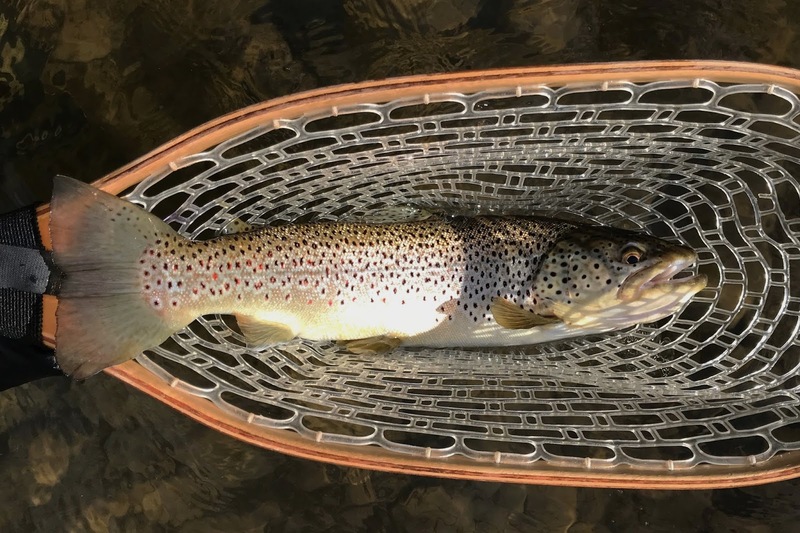 Mostly March Browns and medium spinners took fish. The Beaverkill and Willow were RAGING. Looked barely fishable. I saw people fishing, but I didnt see anyone actually in the river.